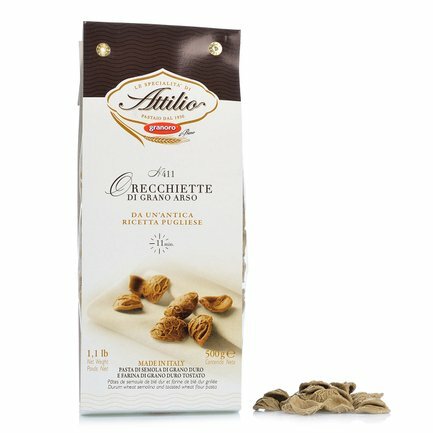 The Orecchiette Grano Arso are made using durum wheat semolina and toasted durum wheat flour. The origins of grano arso, which means burnt grain, go back to the tradition of peasants collecting the grains of wheat that remained in the burnt, post-harvested fields, in order to make the black flower used to make optimal pasta and focaccia. In order to obtain the same flavour today, the bread is toasted until obtaining the smoky aroma of long ago. 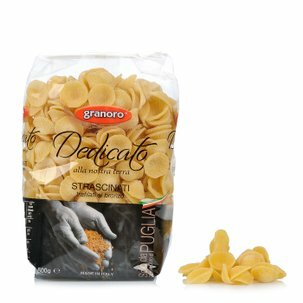 These orecchiette are perfect for preparing typical pasta dishes from the Pugliese tradition. Ingredients durum wheat semolina, toasted durum wheat flour 15%, water. Allergens: Contains gluten. May contain traces of eggs. For more information on product labels, please contact our Customer Service department. The information on the labels of the products may vary for reasons beyond our control, therefore, there may be discrepancies between the information on the site and that on the products delivered. Please always check the information on the product before consumption or use. Pastificio Granoro, which was created from the passion of the master pasta maker Attilio Mastromauro, was established in Corato, in the heart of Puglia. 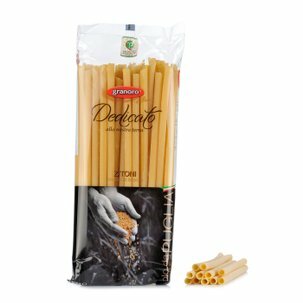 This region has been famous since ancient times as being the typical area for producing the best durum wheat on a national and European level, which is used to make the delicious pasta that is loved and appreciated all over the world. The bronze die extrusion and slow natural drying define the production process that is targeted towards maintaining the full flavour of the natural ingredients that you serve at home.